ORLANDO, FL / ACCESSWIRE / December 27, 2016 / Central Florida golf and sports fans can score a 33 percent discount for weekend-long and daily tickets to the Diamond Resorts Invitational benefiting Florida Hospital for Children by visiting Walgreens stores. Over 200 Walgreens stores are participating in the program, which offers the regularly-priced $60 three-day pass for just $40 and the daily pass at just $20, or $10 off. The newly-minted tournament is in its second year and is now part of the PGA TOUR Champions schedule as the first event of the new year, Jan. 13-15 at Tranquilo Golf Club at Four Seasons Resort Orlando at Walt Disney World Resort. Thirty PGA TOUR Champions players and 48 top-tier sports and entertainment celebrities will compete for $1.25 million in prize money. Further information is available at www.DiamondResortsInvitational.com, where full-price tickets are currently available. Early commitments from PGA TOUR Champions professionals include John Cook, Mark Calcavecchia, Lee Janzen, Scott Hoch and Jeff Sluman. Between them, the five Champions players represent 49 PGA TOUR and 23 PGA TOUR Champions victories, including four major championships and more than $123 million in career winnings. Ticket holders will be able to get up close and personal with sports and entertainment stars including Marcus Allen, Roger Clemens, Josh Donaldson, Colt Ford, Tom Glavine, Greg Maddux, Brian McCann, Kevin Millar, Mike Modano, Mark Mulder, Blair O'Neal, Jake Owen, Alfonso Ribeiro, Jeremy Roenick, Mark Rypien, Emmitt Smith, John Smoltz, Cole Swindell, Brian Urlacher, Justin Verlander, Larry the Cable Guy and defending champion Mardy Fish. "This event has become a community-wide partnership with Walgreens' participation plus the regional golf community, Tranquilo Golf Club and Disney, all in support of Florida Hospital For Children," said Michael Flaskey, executive vice president, chief sales and marketing officer, Diamond Resorts International®. "There is no other tournament like this in America with PGA TOUR winners of major titles competing alongside World Series and Super Bowl sports heroes." Competition will utilize a Modified Stableford scoring format which awards points as opposed to strokes - similar to the PGA TOUR's Barracuda Championship. The singular format allows for a distinct competition as all professionals and celebrities play their own ball and compete from the same tees for 54 holes. PGA TOUR Champions players will compete for $750,000 over the 54-hole tournament, while the celebrities will play for a $500,000 purse. Threesomes will include one Champions Tour professional and two celebrities. Though not part of the Charles Schwab Cup season-long competition, the Diamond Resorts Invitational is the final "Challenge Season" tournament before the Tour's Regular Season opening event the following week, January 16-22 at the Mitsubishi Electric Championship at Hualalai at Hualalai Golf Club in Ka'upulehu-Kona, Hawaii. 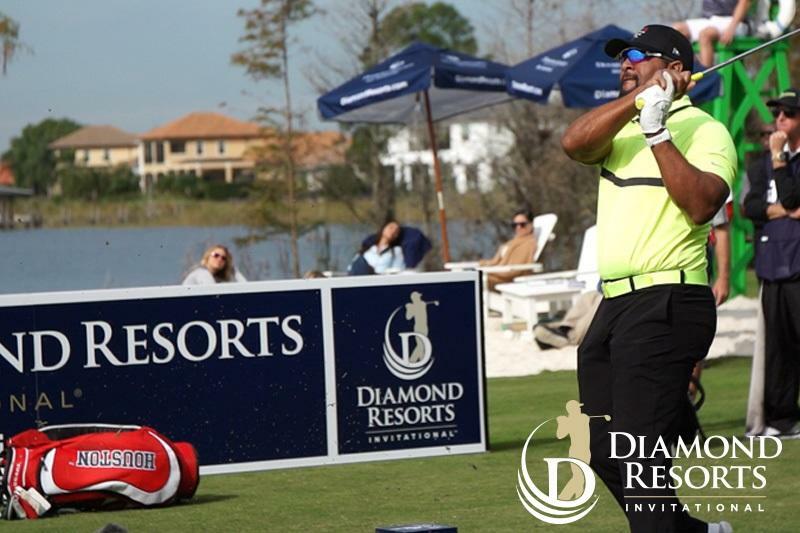 This past January, the inaugural Diamond Resorts Invitational featured 69 celebrities in the field with former No. 1-ranked American tennis player Mardy Fish winning the event. Activities for the whole family took place throughout tournament week and the silent and live auctions raised $503,000 in charitable donations for Florida Hospital for Children. Florida Hospital for Children is one of the premier children's hospitals in the nation, setting standards for innovation, quality and comprehensive care. The child-centric healing environment designed to keep kids comfortable is complemented by a staff of world-class doctors, specialists, nurses and healthcare professionals utilizing advanced technologies, therapies and treatments. Florida Hospital for Children's team of over 135 highly skilled pediatric specialists delivers extraordinary care across more than 35 pediatric subspecialties, including a children's emergency department, the Level IV Comprehensive Pediatric Epilepsy Center, a world-renowned pediatric heart center and a Level III neonatal intensive care unit (NICU). Tournament week will begin Thursday, January 12 with the fourth-annual Brian Gay Pro-Am presented by Diamond Resorts International®. Gay, a four-time PGA TOUR winner and longtime Orlando resident, will serve as host of the 18-hole celebrity-amateur competition, which will feature foursomes comprised of three amateurs and one celebrity or PGA TOUR Champions player. An evening gala and headliner concert at Mystic Dunes Resort and Golf Club, a Diamond Resorts flagship resort in Orlando, will complement the day's events. The tournament site, Tranquilo Golf Club at Four Seasons Orlando was designed by Tom Fazio and opened in 1992 as Osprey Ridge; Fazio enhanced the Orlando golf course for its October 2014 launch as Tranquilo Golf Club at Four Seasons Orlando. The course is a par 71 and plays to 6,901 yards. All three rounds will be televised live by the Golf Channel culminating with the final round on Sunday, Jan. 15. All service men and women and first responders can enter the promo code "SALUTE2017" on the website to locate the designated registration page. The ticket voucher (printed out at home or reserved for pickup at the event) will need to be exchanged at the onsite will call/ticket station before entering the event. Participants must show photo ID and official military or first responder identification to receive their complimentary admission. *Tickets will be available to the first 1,000 entrants. Diamond Resorts International, with its network of more than 370 vacation destinations located in 35 countries throughout the continental United States, Hawaii, Canada, Mexico, the Caribbean, South America, Central America, Europe, Asia, Australia and Africa, provides guests with choice and flexibility to let them create their dream vacation, whether traveling an hour away or around the world. Our relaxing vacations have the power to give guests an increased sense of happiness and satisfaction in their lives, while feeling healthier and more fulfilled in their relationships by enjoying memorable and meaningful experiences that let them "Stay Vacationed.™"
Florida Hospital for Children is a seven-story, 201-bed state-of-the-art facility designed with the help of Walt Disney Imagineers, families and clinicians. Our team of over 135 highly skilled pediatric specialists delivers extraordinary care across more than 35 pediatric subspecialties, including a Children's Emergency Department, the Level IV Comprehensive Pediatric Epilepsy Center, a world-renowned Pediatric Heart Center and our Level III Neonatal Intensive Care Unit (NICU). With more than 23 pediatric specialty surgeons performing complex operations in a safe and child friendly environment, Florida Hospital for Children is a destination for health and healing. Learn more at www.FloridaHospitalforChildren.com. PGA TOUR Champions is a membership organization of golfers age 50 and older, with the most recognizable and accomplished players in the game - including 34 members of the World Golf Hall of Fame, which compete regularly in its events. PGA TOUR Champions is where Legends play, and is home to The Ultimate Clubhouse. Conceived in 1980 as the Senior PGA Tour, it started with just four events and purses totaling $475,000. The primary purpose of PGA TOUR Champions is to provide financial opportunities for its players, entertain and inspire its fans, deliver substantial value to its partners, create outlets for volunteers to give back, protect the integrity of the game and generate significant charitable and economic impact in communities in which it plays. In 2016, the newly-introduced Charles Schwab Cup Playoffs will identify and recognize the Tour's leading player via a season-long race for the Charles Schwab Cup. The Commissioner of the PGA TOUR is Tim Finchem. Greg McLaughlin is President of PGA TOUR Champions. The PGA TOUR's website is pgatour.com, the No. 1 site in golf, and the organization is headquartered in Ponte Vedra Beach, Fla. Follow PGA TOUR Champions at facebook.com/PGATOURChampions and on Twitter @ChampionsTour.